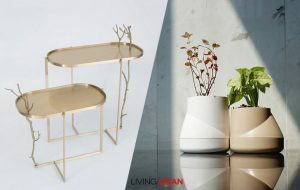 The Bangkok Design Week that ended February 3 was a confluence of many great ideas, among them products of a collaboration between two homegrown designer groups, Thinkk Studio, and Studio 150. Their waste recycling ideas shone with excitement at a show called “City Materials”. 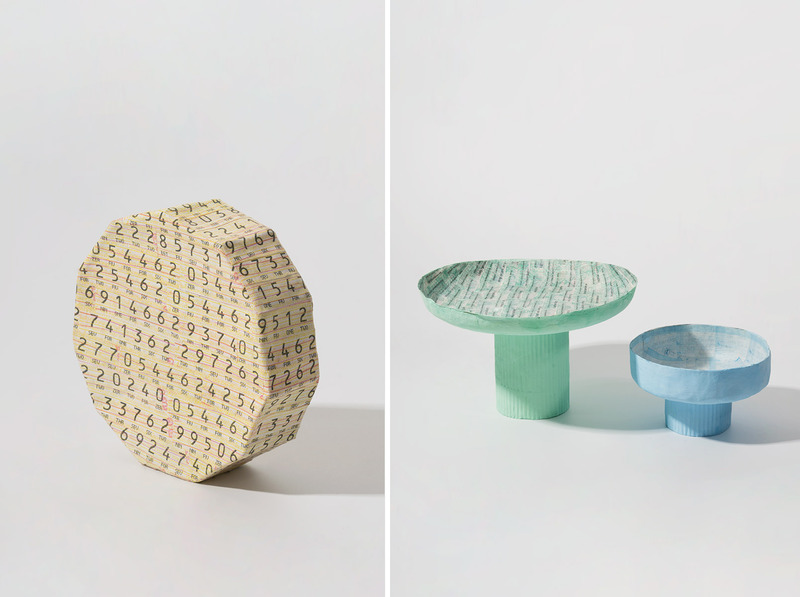 A variety of interlacing designs made from strips of lottery paper waste. 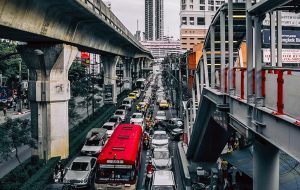 The seat of government of Thailand, Bangkok is renowned for being a regional trade and economic hub, as well as home to many established and up-and-coming designers. Much of the large, densely populated city is not covered with forest. 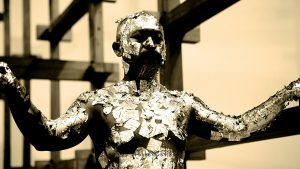 Nor does it have a wonderful richness of industrial materials. But, do you know this? 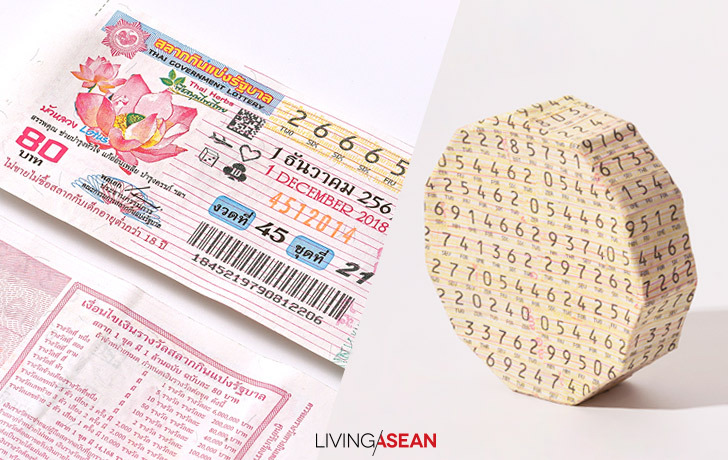 Every fifteen days, the number of lottery tickets and packaging material printed in Bangkok is enough to cover 173 football fields. Of that amount, a whopping 98.6% accounted for the tickets that didn’t win. 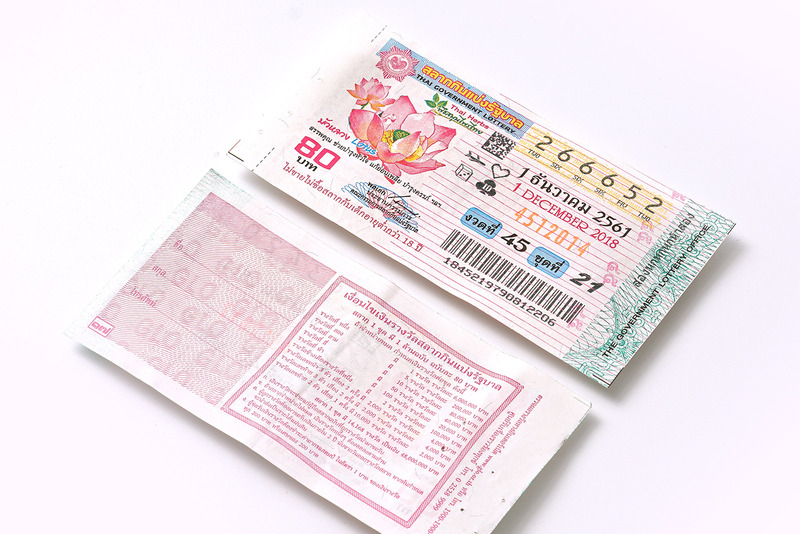 Not only that, lottery tickets are printed on special grade, water-repellent paper that doesn’t break down easily. All things considered, that’s a whale of a job for paper recyclability. 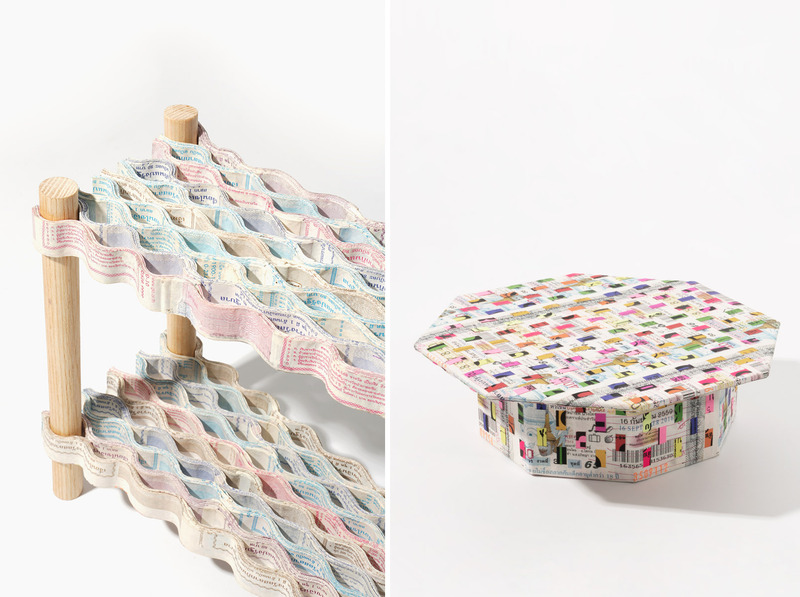 A spinning toy for kids, the top, is made of a bundle of lottery paper strip. 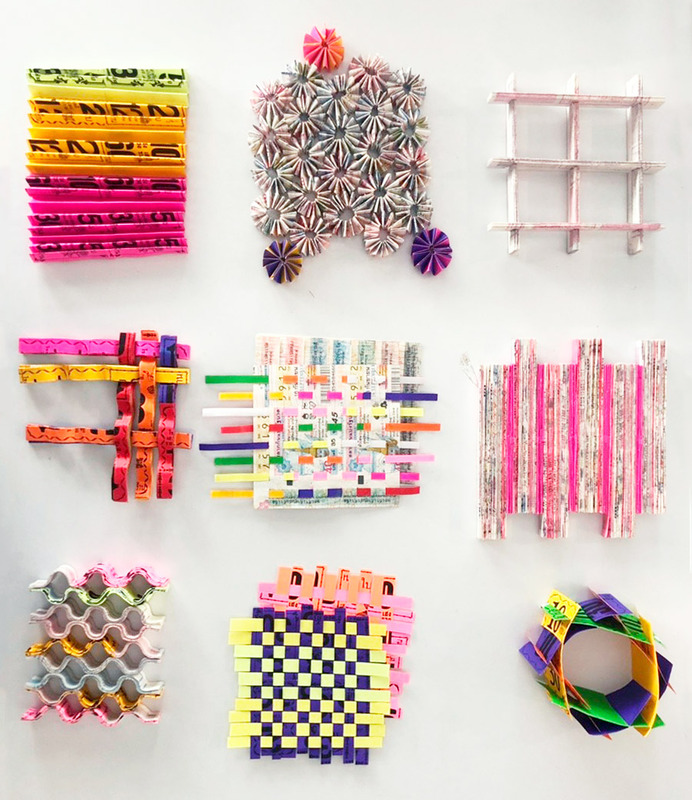 Where most would see useless waste materials, the two designer groups see endless possibilities. 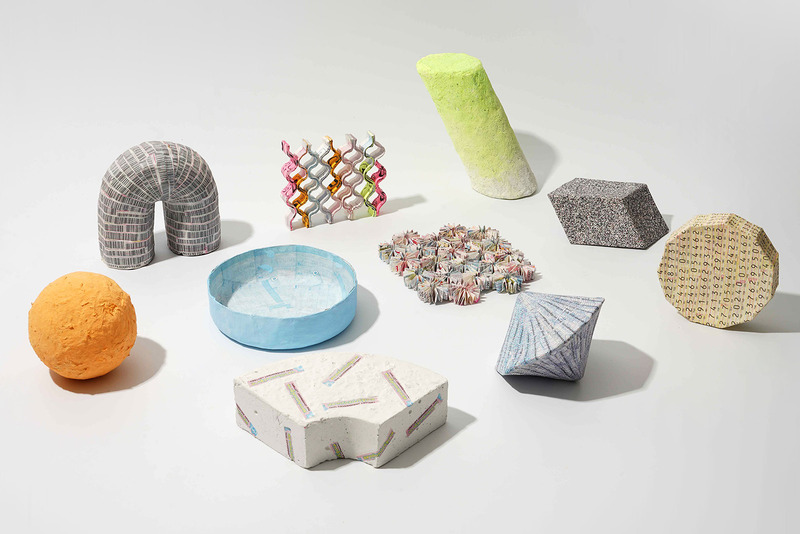 Thinkk Studio creatives, in association with their design peers at Studio 150, have researched and experimented with lottery paper waste for some time. 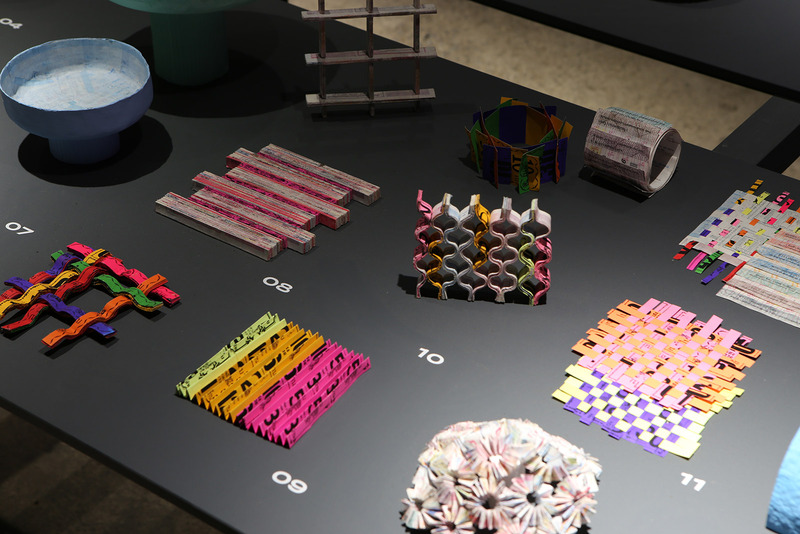 They succeeded in recycling it in ways that could answer specific design, art and craft and industrial needs in future. 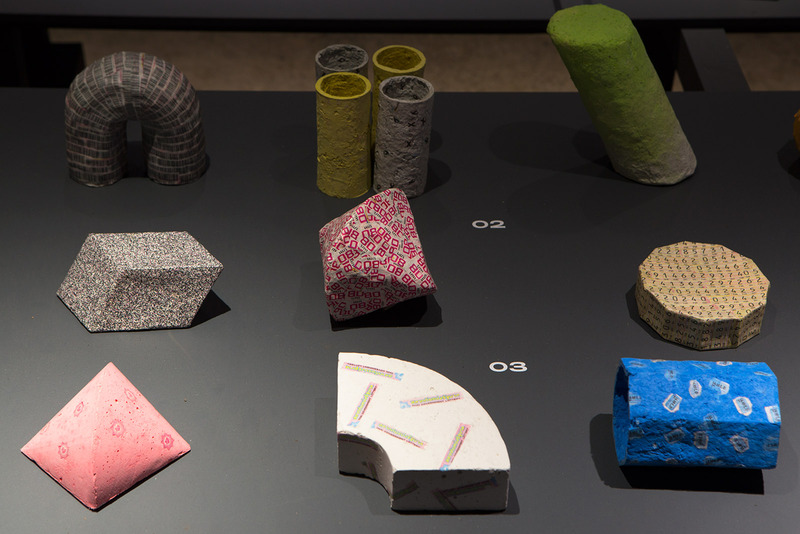 “City Materials” showcased five materials the joint team has recycled from wood chips, plastic bags, incense sticks and ashes, coffee grounds, and discarded building supplies sold for scrap. For a glimpse into their design ideas. 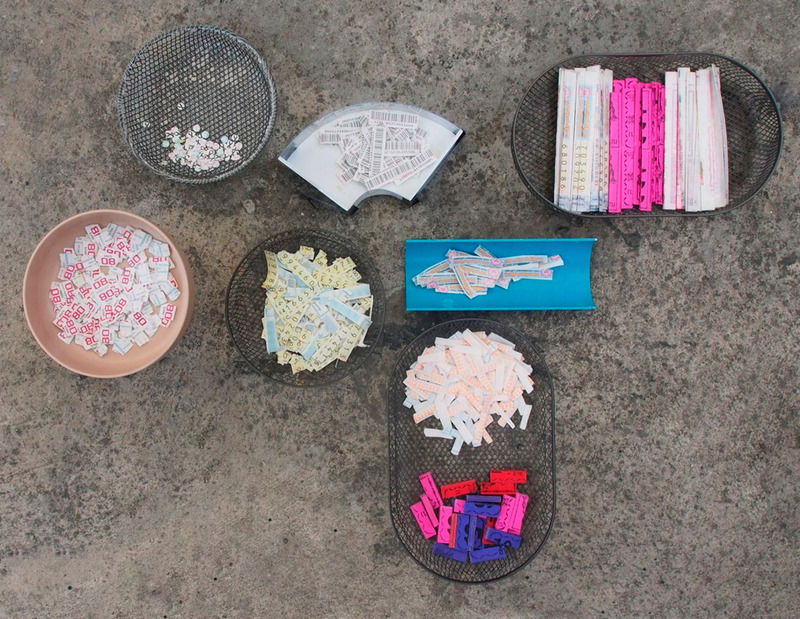 A collection of papier-mache constructed out of QR Code sections of the lottery tickets. 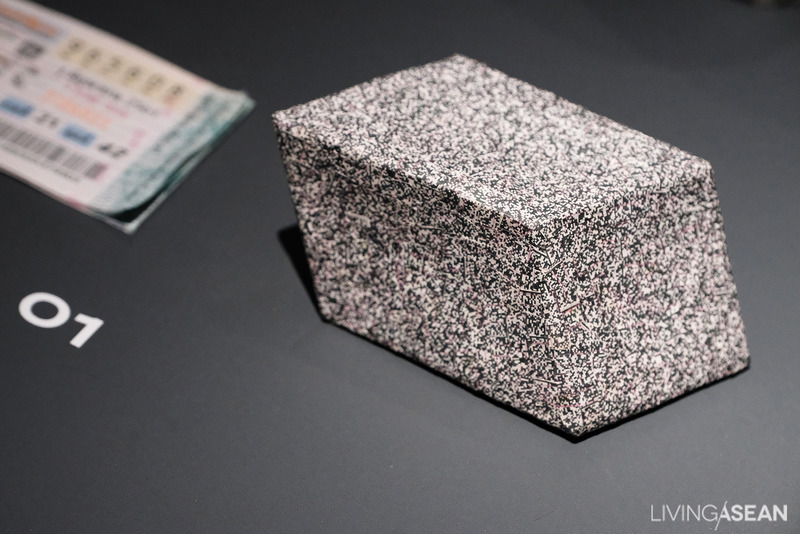 The malleable mixture, three-dimensional object becomes hard when dry. 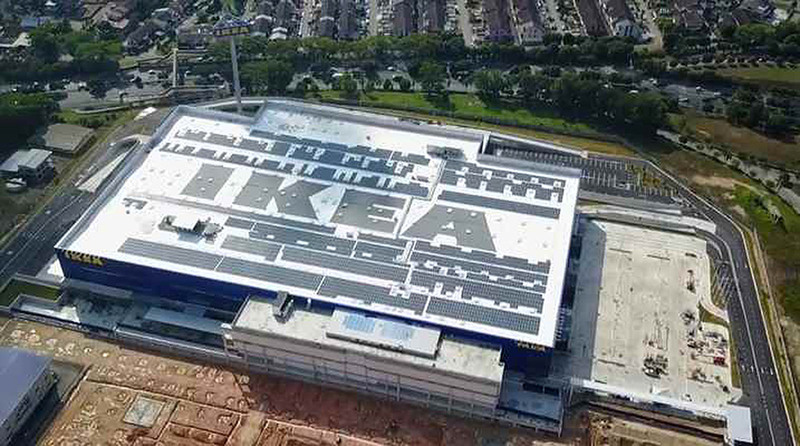 The new IKEA store in Johor, Malaysia was dubbed Southeast Asia’s largest when it opened for business four months ago. That’s about to change as the candidate for the top spot will open in Thailand in a matter of days. 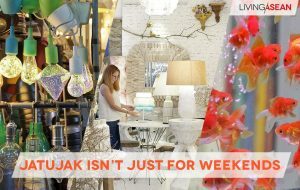 The world-renowned, Swedish-founded furniture retailer will launch its newest, largest store in Southeast Asia in Bang Yai, Nonthaburi on March 15. It will be the country’s second IKEA store that’s geared towards meeting the needs of people in Nonthaburi as well as outlying districts in Bangkok’s Northwest. IKEA Bang Yai will be the Swedish chain’s largest store in Southeast Asia come March 15. 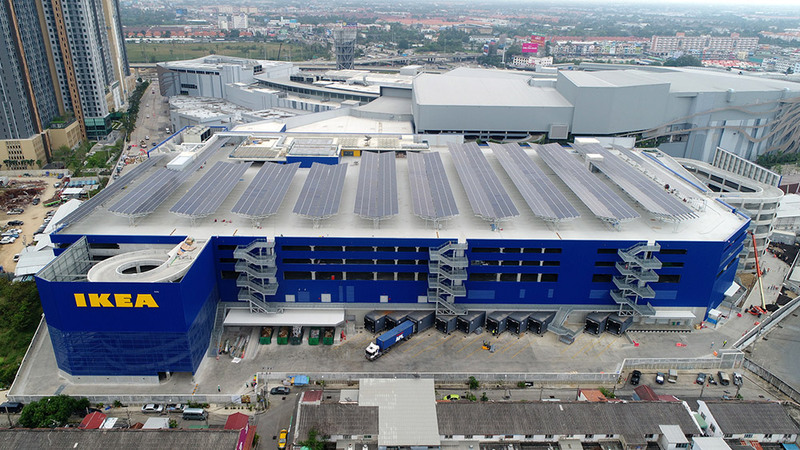 The newest retail establishment in Bang Yai spreads over a surface of 50,278 square meters, compared to 46,700 square meters at the IKEA Tebrau store in Johor. The Malaysian store was opened on November 16, 2017. The IKEA Bang Yai store is partially solar-powered. Its solar arrays comprising 4,548 photovoltaic cells mounted on the rooftop are capable of producing 1.5 megawatts per year, or about 13% of the building’s electricity needs. It is LEED certified for quality and achievement in green building features. Unlike other IKEA retail establishments, the Bang Yai store has cashier stations on every floor. The new design enables shoppers who are short on time to get in and out of the store faster. 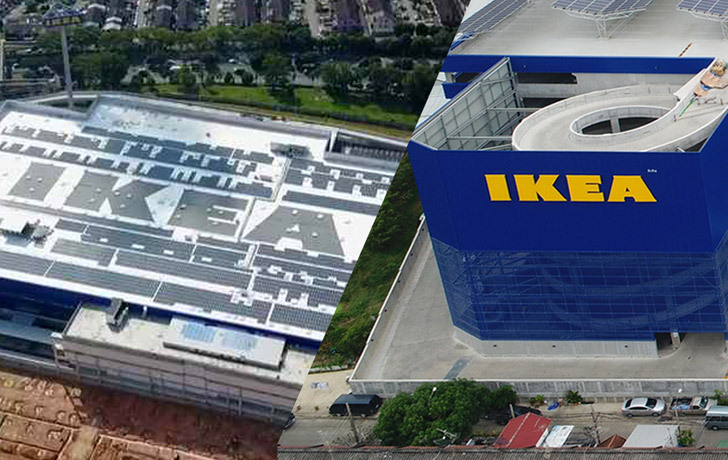 IKEA’s world largest store is located in South Korea. Opened in December 2014, the IKEA Gwangmyeong has 59,000 square meters of business space. 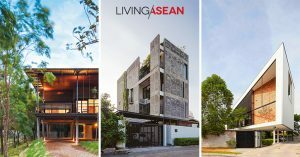 The chain retail establishment has six stores in Southeast Asia — two in Singapore, three in Malaysia, and one in Thailand. 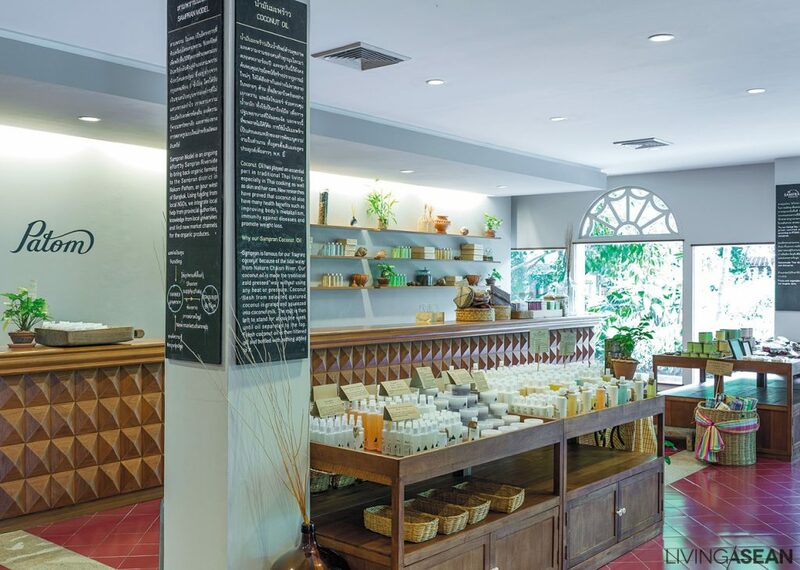 The Bang Yai store will be number 7 in the region. Despite the omnipresence of the Internet in society today, there seems to be a disconnect between the impact of pollution and access to the information needed to protect public health. Strange as it may sound. According to a 2017 estimate by the environmental tech company Plume Labs, only 0.246% of the earth has access to that vital information. As air pollution levels rise from Hanoi to Ho Chi Minh City, Bangkok to Yangon, and Phnom Penh to Jakarta, it’s wise to stay abreast of the latest developments. There are many websites and apps that measure the concentrations of both PM2.5 and PM10 and other pollutants. 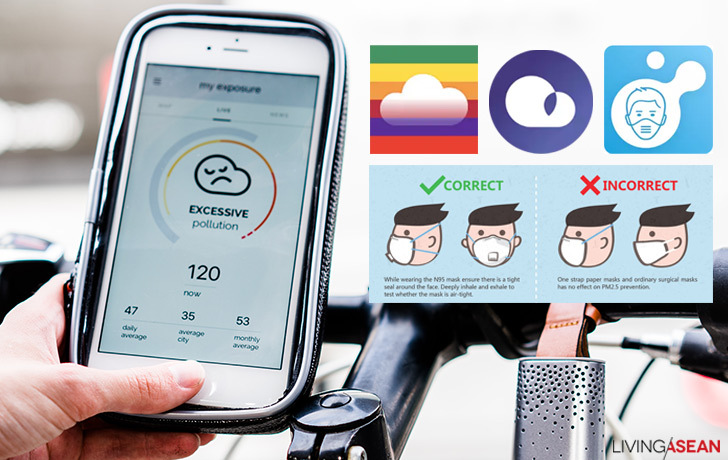 Here are three useful apps to check air quality wherever you are. An example page of the Real-time AQI app. An example of Real-time AQI’s advisory page showing air pollution values, concentrations of airborne particulates, and protective mask recommendations by Greenpeace. 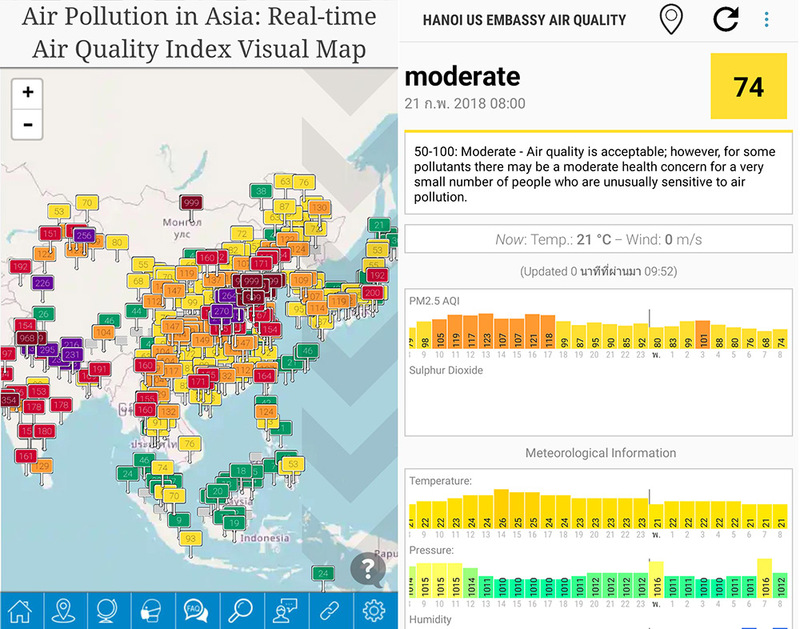 The Real-time AQI app for Android and iOS shows air quality information from more than 10,000 monitoring stations in over 60 countries, including mainland China, Korea, Japan and countries across Southeast Asia. It provides, among other things, data about the concentrations of smaller airborne pollutants (PM2.5) and larger particulates (PM10). The former refers to extremely small particulate matter 2.5 micrometers or less in diameter or about 3% the diameter of human hair. Updated hourly, the same information is linked to the developer website http://aqicn.org along with data on harmful gases and other readings such as temperatures, pressures, and humidity. The site also publishes visualized maps and protective mask recommendations from the global independent campaign organization Greenpeace. 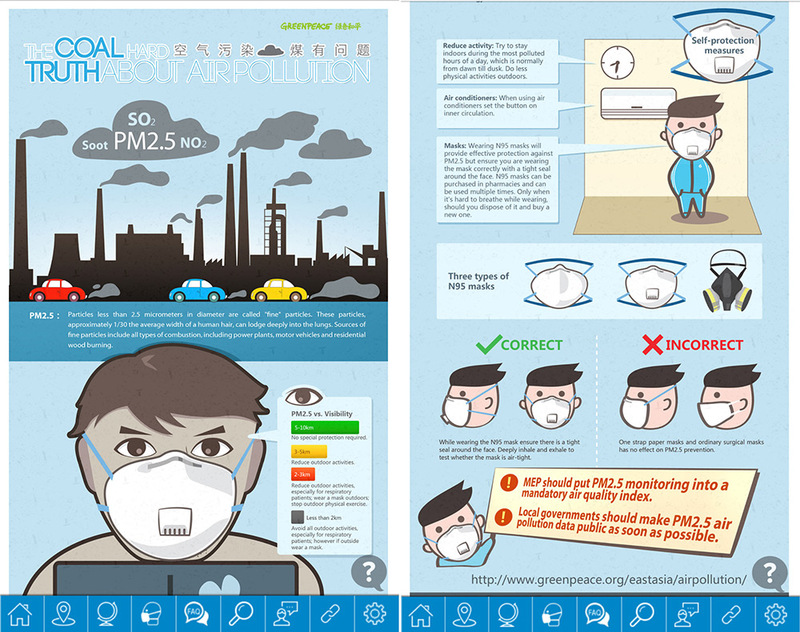 Get to know three types of masks to protect you from PM2.5 that ordinary surgical masks cannot. Whether it’s on the mobile app or the website, good infographics are worth a thousand words and a good place to start researching. 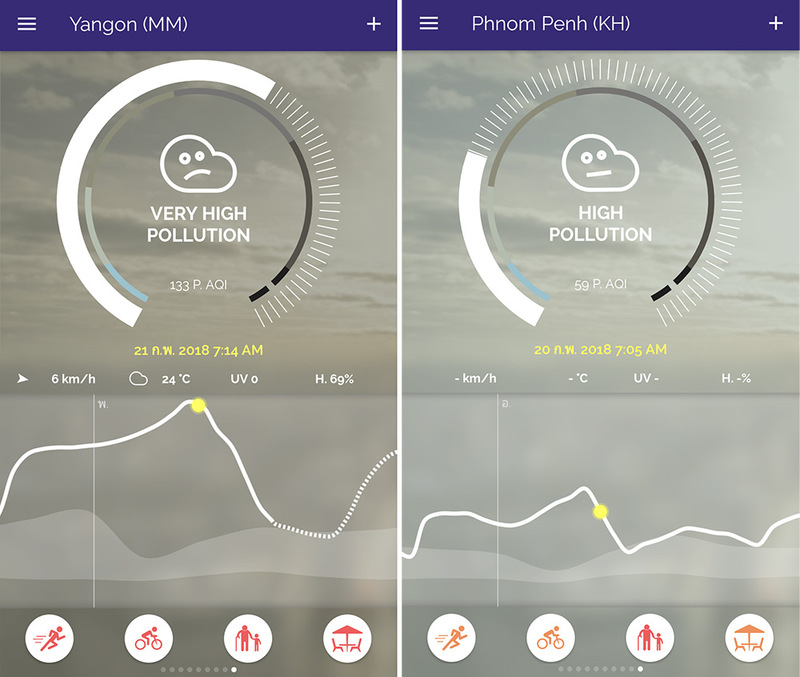 Plume Air Report provides air pollution levels in Yangon and Phnom Penh, which are not listed in the AQI app. 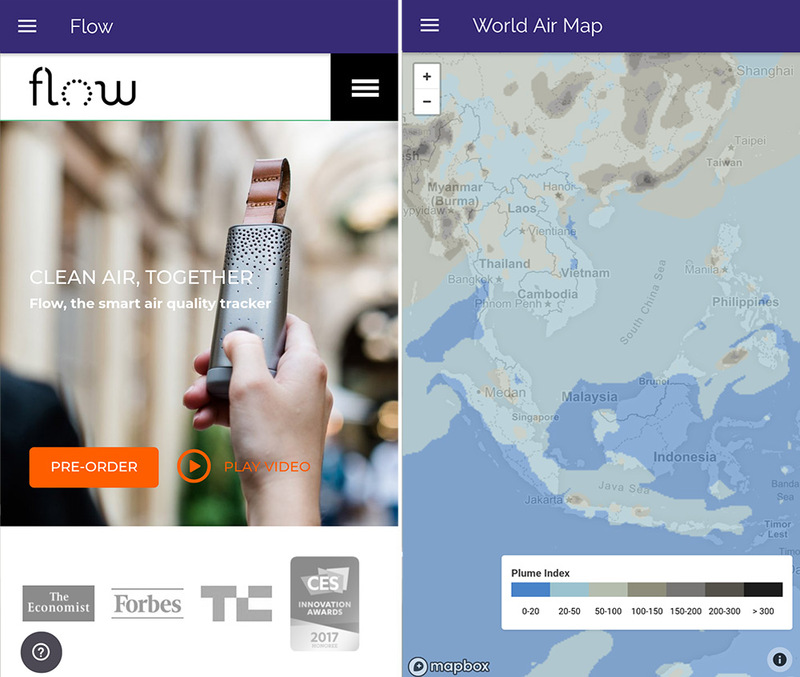 Flow, a portable instrument for checking air quality values and weather maps by Plume Air Report. Plume Air Report on the iPhone is a reporting and forecasting app that tracks real-time air pollution levels for every city in the world. The environmental tech company (website https://plumelabs.com) is the maker of “Flow,” a mobile personal air tracker that measures harmful pollutants indoors and outdoors. Real-time data including air quality indices, temperatures, UV levels, winds, and humidity are updated hourly along with pollution forecasts for the next 24 hours and statistics for the past 7 days. Flow makes it possible to track harmful air pollutants even in cities without AQI monitoring stations. The device is open for pre-order. Check the website for availability. 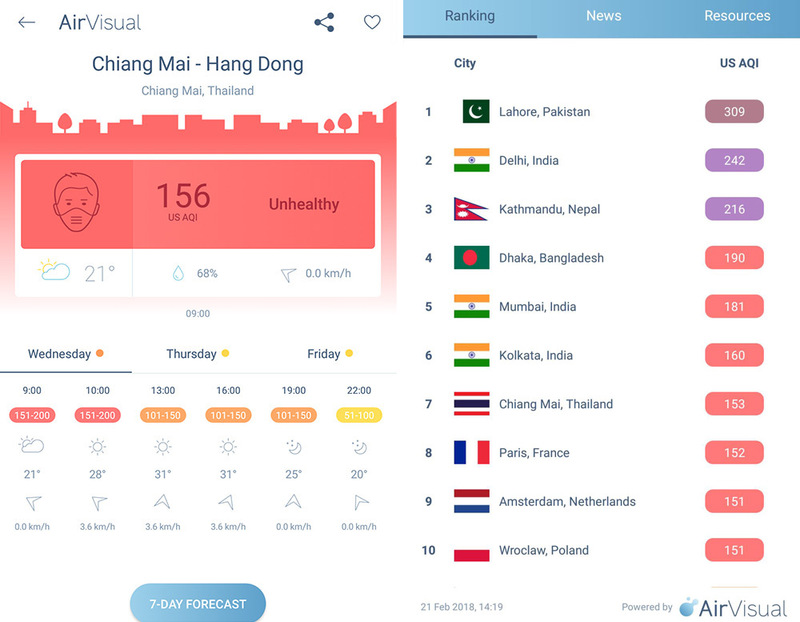 An example page of the AirVisual app showing unhealthy air pollution levels in cities across the globe. The information is updated hourly. AirVisual is a real-time and forecast air quality app that provides AQI indices for over 70 countries worldwide. Available on both Android and iOS, the free app gathers information from more than 9,000 locations via global networks of government monitoring stations and AirVisual’s own sensors. By giving historical, real-time, and forecast air pollution data, AirVisual is a pocket guide to avoiding harmful airborne particles. The AirVisual Earth Map is a good place to start tracking pollution levels and weather conditions with hourly updates. 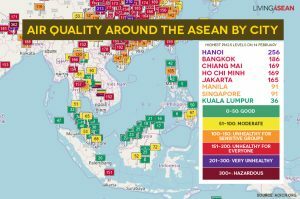 In Southeast Asia, notably Bangkok, Chiangmai, Hanoi, Ho Chi Minh City, and Jakarta, thick haze of air pollution isn’t going away any time soon. As the fight for clean air continues, it pays to be in the know and avoid places with high concentrations of PM2.5 and PM10. 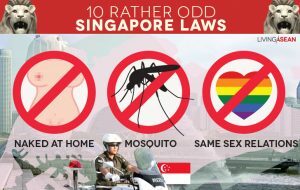 The mobile apps mentioned above are three of many technologies designed to get the message across in the interest of public health and safety. Besides their tremendous importance for the environment, big trees have great societal value as study sites, tourist attractions, or centers of communities. 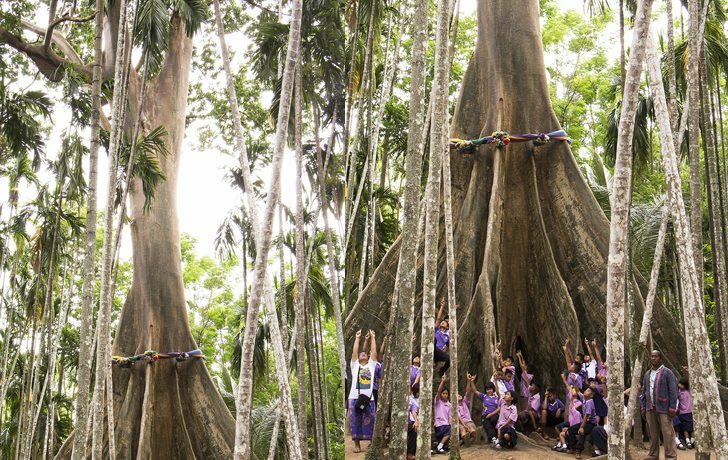 Come along as Living ASEAN and the BIG Trees Project travels around Thailand to see ten magnificent trees. 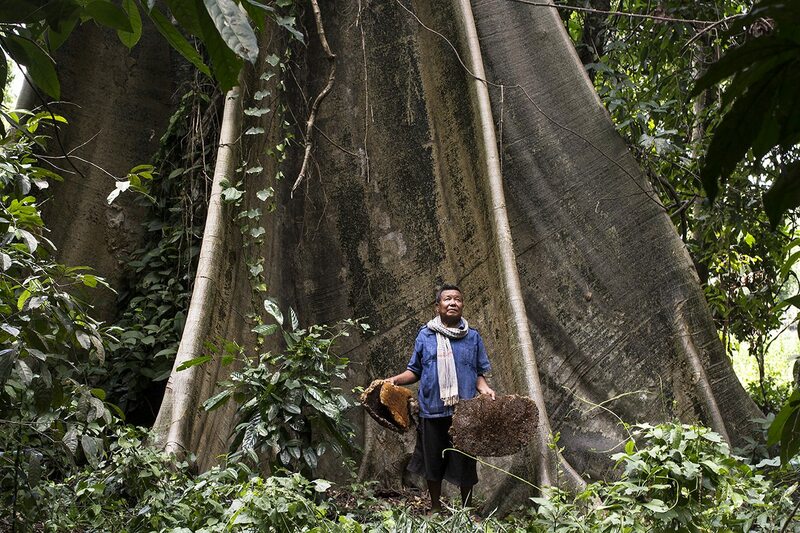 This giant tualang is on private land in the middle of a forest, but the landlord is happy to let everyone come visit. One side of the tree has the claw marks of a bear trying to knock down a honeybee nest. The Lao villagers here are descendants of settlers brought here two hundred years ago as an outpost in the conflicts with Burma. 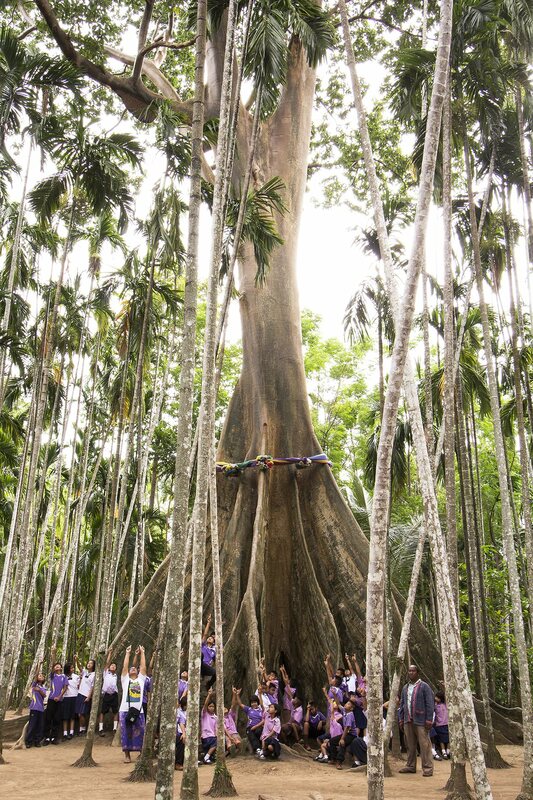 *”Buttress roots” reach from branches to the ground to support the tree. 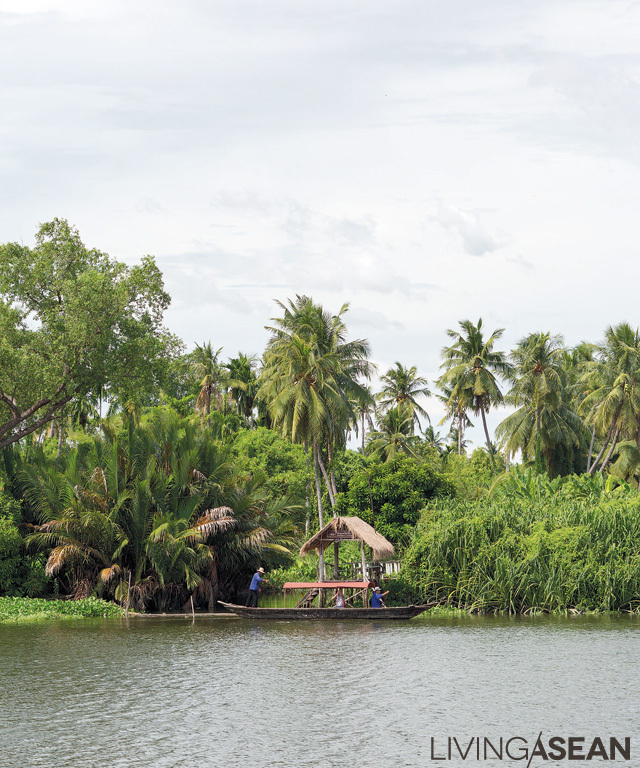 At Klong Sung Nae fresh water runs into the sea, creating a combined “two waters” (song nam) ecosystem. Rowing along the stream you pass beneath disorderly hanging roots of 200-year-old banyans while traversing a rich natural environment: a grove of 6 remarkable ficus trees, black hornbills, snakes hunting for food . . . if you’re lucky, you’ll see some playful otters jumping and swimming around. 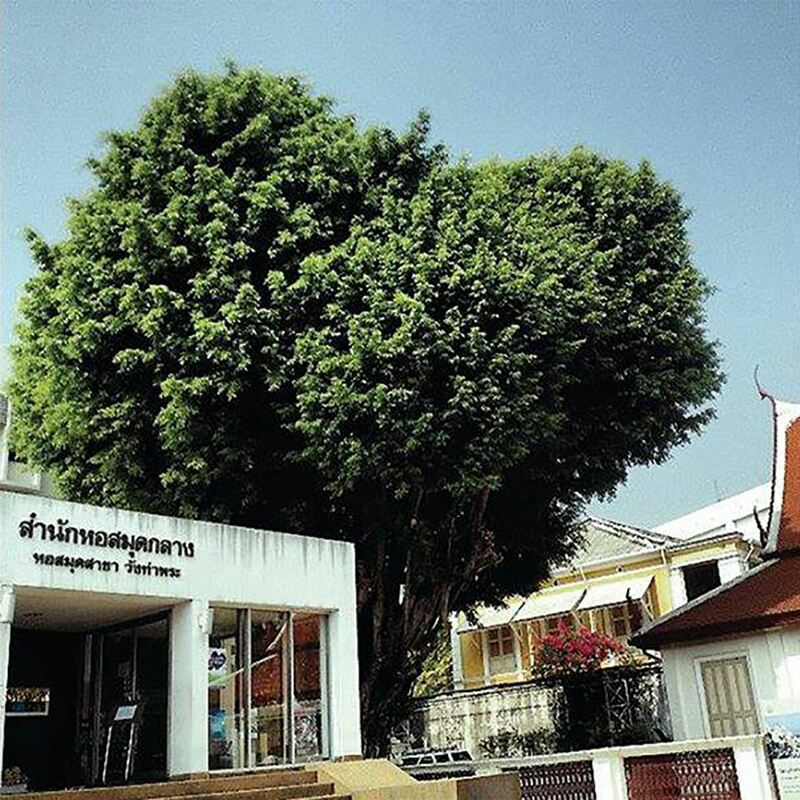 This arboreal colossus is now a Chiang Mai tourist destination with a coffee shop where you can relax and enjoy the view of the lush green forest. 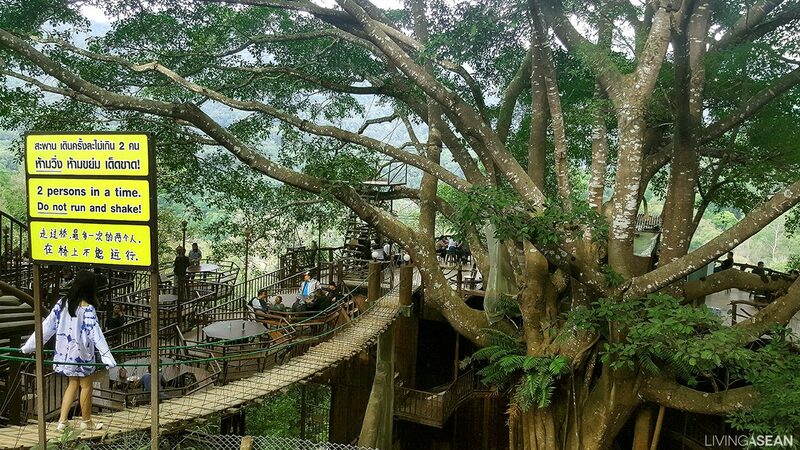 To see The Giant, Chiang Mai you have to drive up a scary, steep, narrow road, but it’s still high on the list of must-see attractions in Chiang Mai’s Mae Kampong District. At the front entrance of Silpakorn University’s central library, its door next to the Royal Palace on Bangkok’s Rattanakosin island, stands this gorgeous bodhi tree. Its charming heart-shaped foliage lifts the hearts of all visitors. Silpakorn University, the first Thai university of the arts, was founded by an Italian. 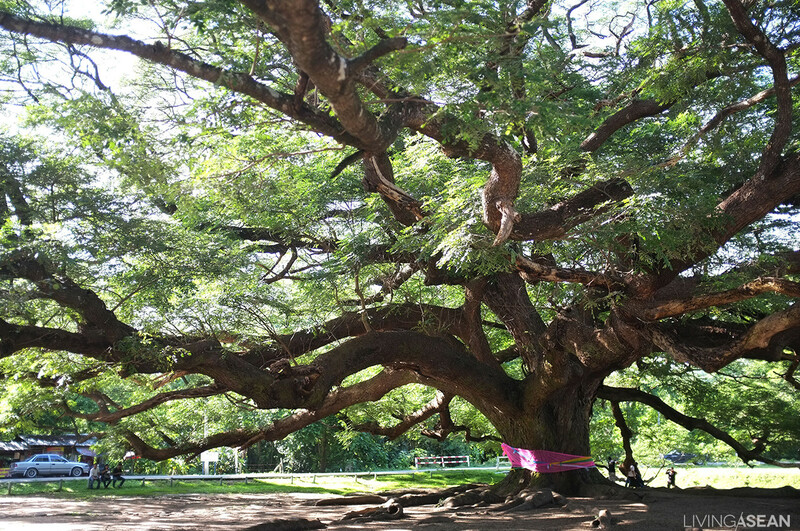 This tree is within a “don pu ta,” where the spirits of ancestors are said to reside. Local villagers have strong beliefs about this, so trees in that area are not cut down. 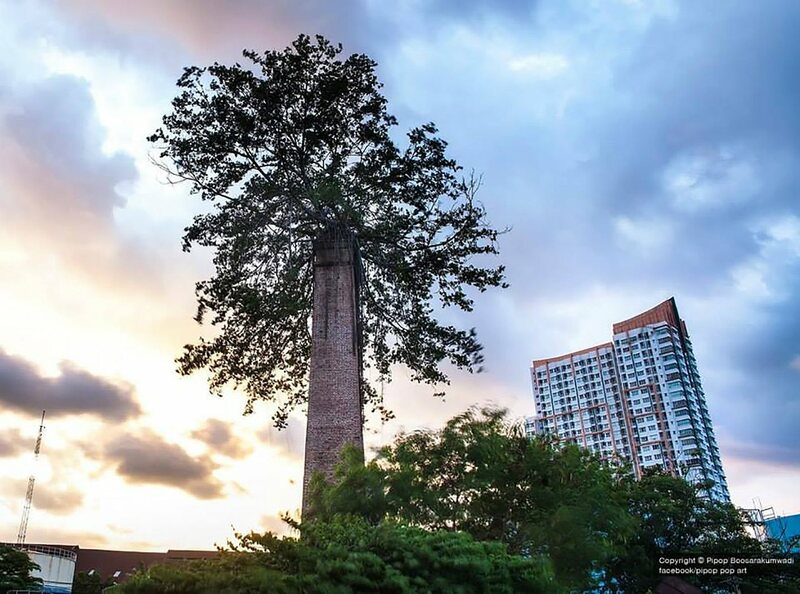 This giant tree has become the residence of bees, bats, ants, birds, and insects living condominium-like on different levels. But it makes a first-class children’s playground during community merit-making festivals based in this ancestral spirit forest. For over five decades “Suan Sampran”, also known as the “Rose Garden,” has been the admiration of everyone. The rich, well-cultivated piece of real estate is also home to a waterfront hotel that many have come to love. Nestled on a 170-rai plot on the beautiful Tha Chin River, the Sampran Riverside Hotel is a real gem. 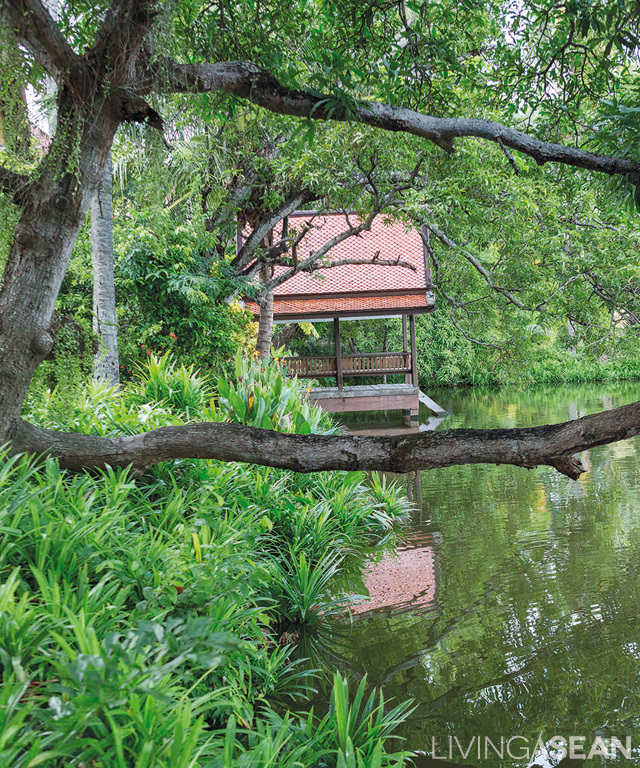 The Sampran Riverside Hotel sits embraced by a circle of trees by the bucolic Tha Chin River. The interior has since undergone a complete makeover giving it modern appeal and a great many conveniences. 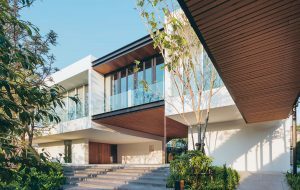 A well-preserved Thai-style home sits at the water’s edge evoking fond memories of riverside living not so long ago. Every residential unit has a pier that juts out over the water. Made for relaxation, the raised structure is hemmed in by lush foliage and mature trees including banyan, mast, and coconut groves. 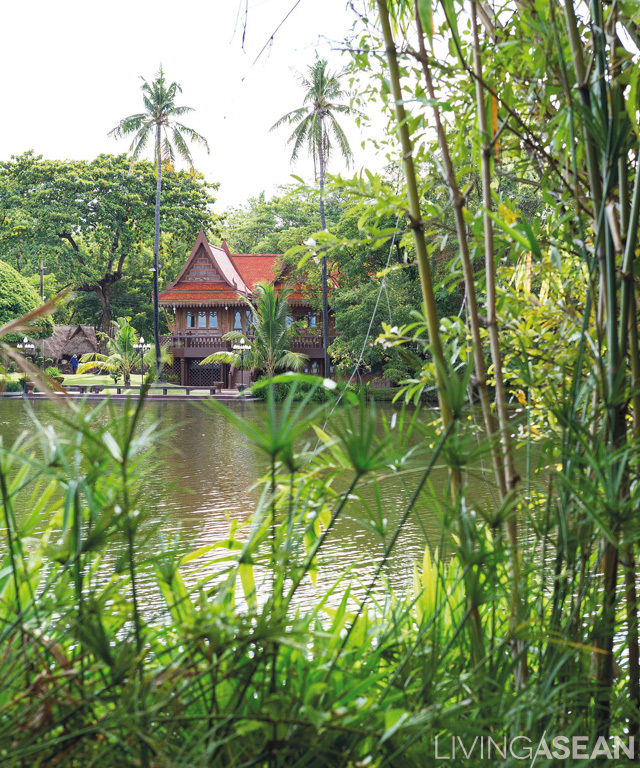 Nearby, fragrant pandan plants thrive turning it into a sweet-smelling pond. 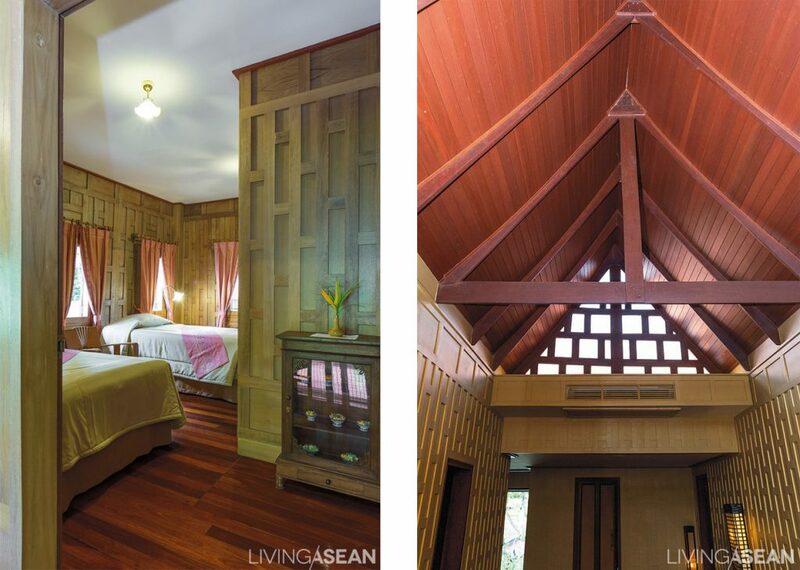 The renovated interior brings out the character of a modern villa complete with many amenities. An air-conditioning unit is hidden in plain sight behind wooden furnishings. /// Steep pitched rooflines add an airy atmosphere to the impressive interior design. The triangular portion of the wall is adapted to offer plenty of openings to allow natural light and make the design appear lightweight. Only the name has changed. The famous Rose Garden is now known as the Sampran Riverside Hotel. Everything else remains the same — great atmosphere, beautiful garden, and cozy accommodations. 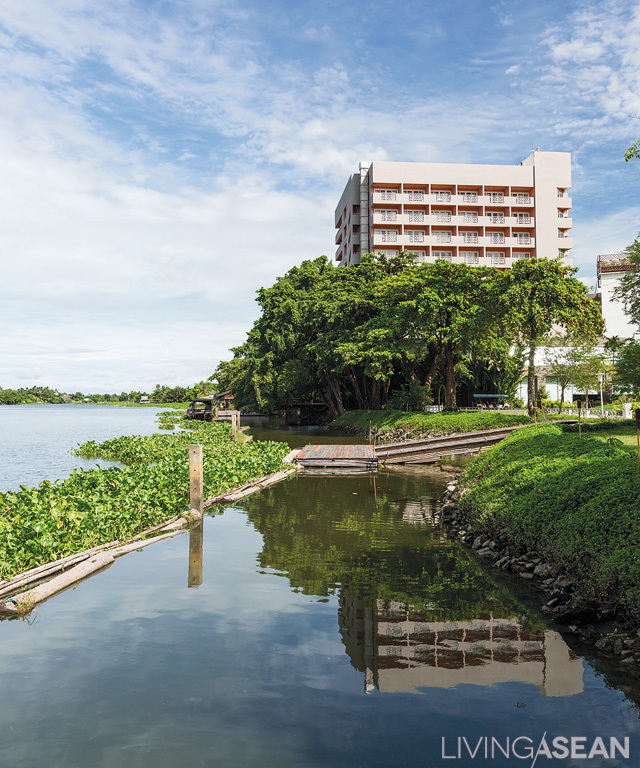 The main hotel building and six Thai-style homes at the water’s edge have undergone complete makeovers. Apart from modernistic interior design and new décor ideas in some corners, the warm and inviting ambience is there like it’s always been. 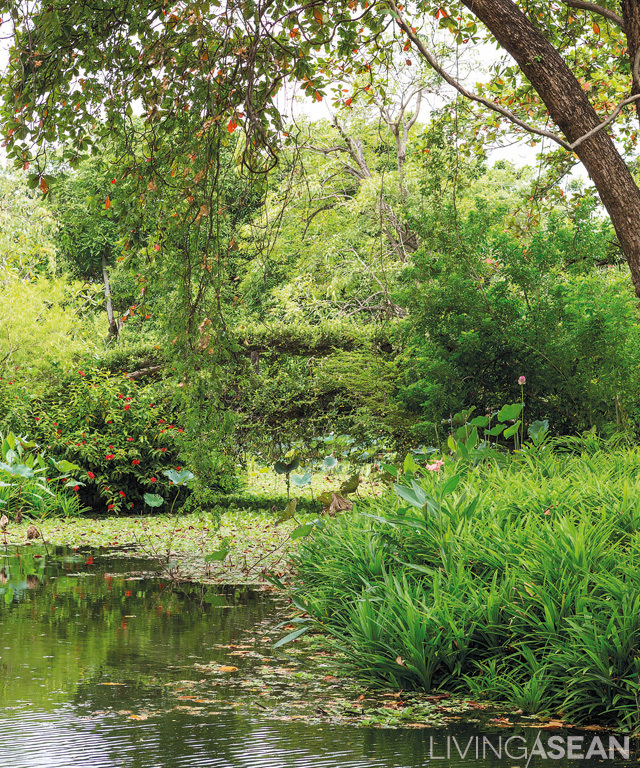 The Sampran Riverside carries on the tradition as a salubrious destination with views of the river, the garden, and the unhurried way of life of the surrounding community. 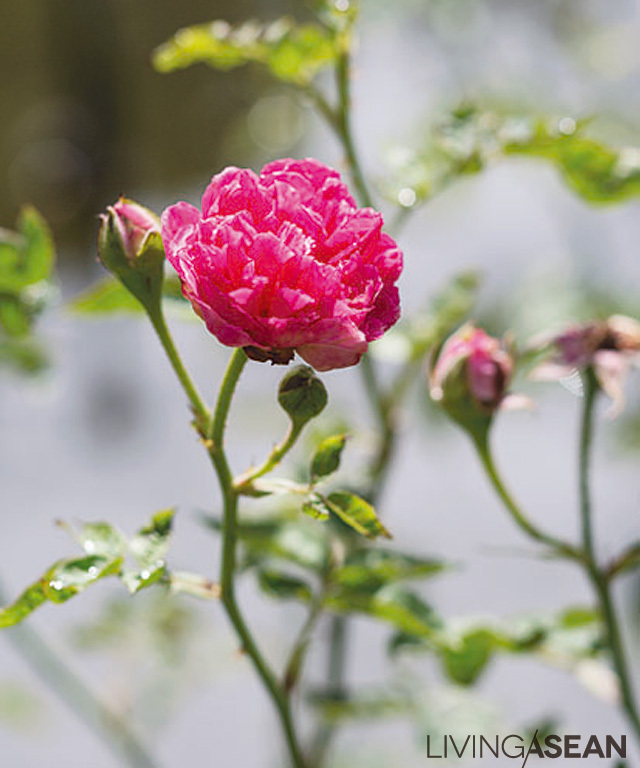 Damask roses thrive in a chemical-free environment. Besides their ethereal beauty, rose petals also have other practical uses. Among other things, Damask rose petals make for sweet-smelling tea when dried. The Thai Village Zone is the hotel’s latest attraction designed to take visitors on a journey back in time. It offers plenty of activities that afford the chance for individual participation. 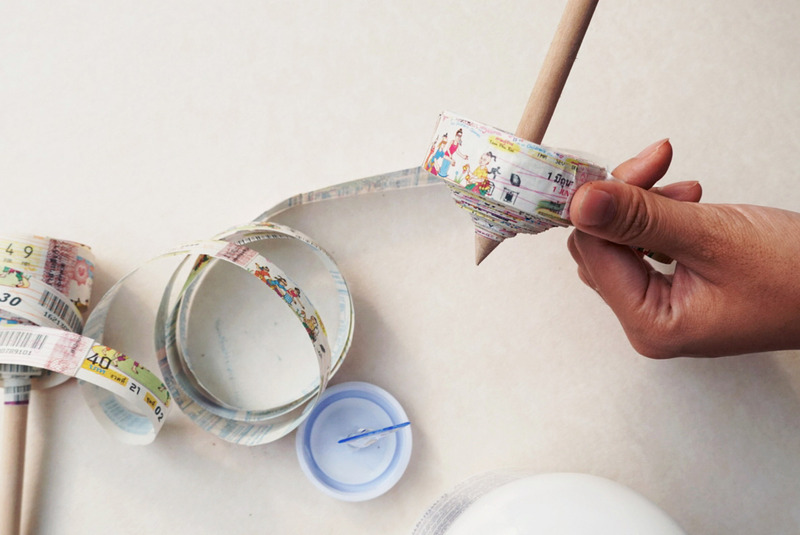 They include traditional textile weaving, flower garland making, and umbrella painting. 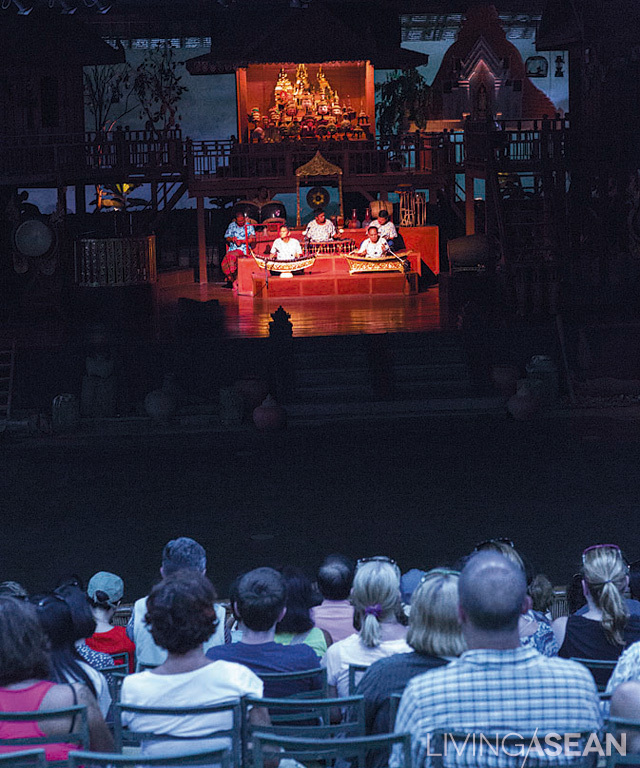 For those who love going to the show, there are folk art performances, music, cultural storytelling, children’s games, martial art performances, and the famous Thai elephants show. Apart from the magnificent Thai elephants show, folk art performances are well received among visitors. Waves of laughter confirm they find great storytelling about the Thai way of life as fascinating as it is informative. The new name was timed to coincide with an entirely new concept in property management. The hotel owners, now the third generation, have decided it was time to go green because nature was home and it deserved to be well looked after. Damask rose farming needed a lot of chemical fertilizers. So the management decided to gradually do away with it. 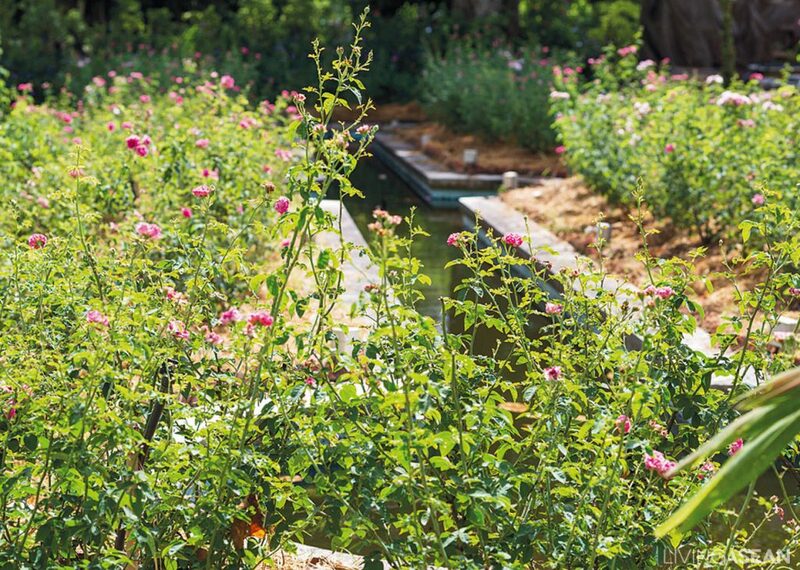 In the process, the land traditionally used for rose cultivation was reduced to just a few small plots. The rest, about 30 rai, was transformed into a thriving organic farm. It was a win-win situation for all. For the hotel workforce, it meant better health and wellness. Nowadays fruits and vegetables are picked fresh every day, enough to meet the needs of four restaurants on the premises. The wetlands ecosystem offer many benefits from supporting plants and aquatic life to filtering spent water before it is made safe and returned to natural waterways. 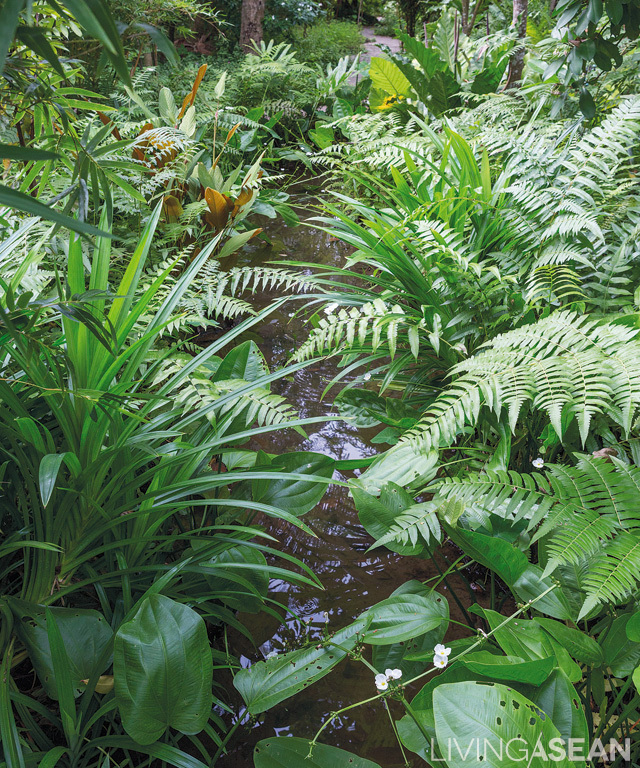 Among the useful species are edible fern (Diplazium esculentum), arrowhead Amazon flowers, and pandan plants (pandanus amaryllifolius). The organic initiative is called the “Sampran Model”. The concept reaches out to agriculturists in the vicinity. The hotel acts a go-between man connecting farmers in Nakhon Patom to consumers both in and outside the community. It encourages agriculturists to avoid using chemicals and set up fair trade markets to promote sales. On weekends it puts on special events to make fresh fruits and produce available to consumers. 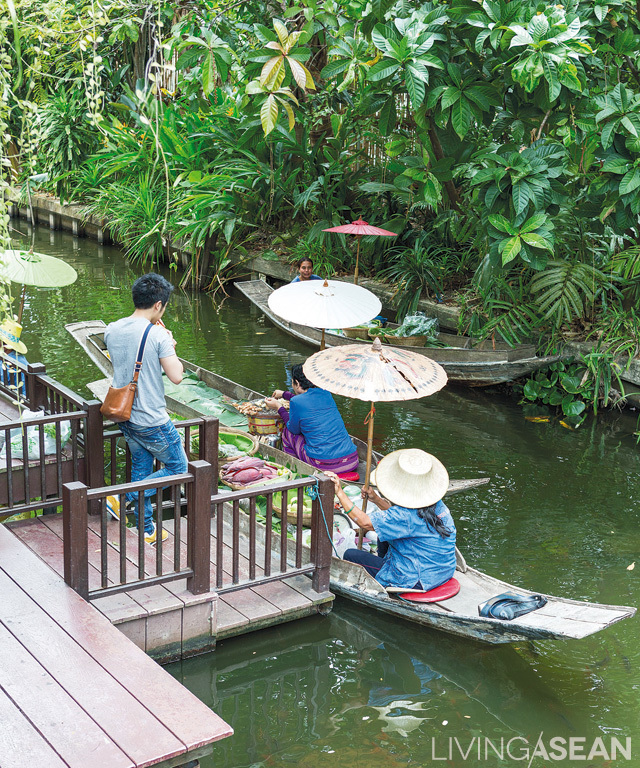 The weekend is the best time to relive the past as the lush oasis comes alive with activity, including the much-talked-about Floating Market. Aboard traditional rowboats, vendors come loaded with good foods as well as fruits and produce picked fresh from neighborhood farms. Our team had the opportunity to catch a ferry ride to the opposite side of the river. We landed on a thriving fruit orchard that was organically cultivated. 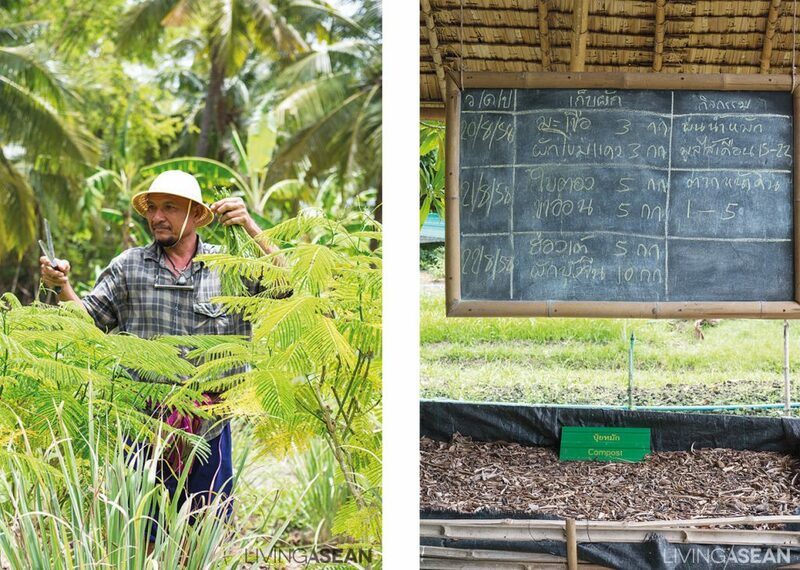 Anirut Khaosanit, also called the local wise man, was kind enough to share his knowledge and years of experience on organic farming. His was a mixed-species vegetable farm, where morning glory, eggplant, climbing wattle and luffa are grown using compost made from green waste. Herbs and pleasant smelling flowers thrive in the front garden. There was never a dull moment. Our day in Sampran was packed with stories and activities. From the vegetable farm, we proceeded to nearby Sook-Jai Market and Rim-Klong Market looking for delicious meals that were made fresh the traditional way. There were plenty of those. Once a rose garden on the Tha Chin River, the newly renovated hotel has grown and become an awesome destination offering upscale accommodations and exposure to cultural exchanges. The Sampran Riverside no doubt has discovered that going green is the way forward. It translates into happiness for all. Pursuing the sustainable path not only benefits the hotel and its guests, but also contributes significantly to the betterment of society to which it belongs. This little hill has been standing here for a very long time. 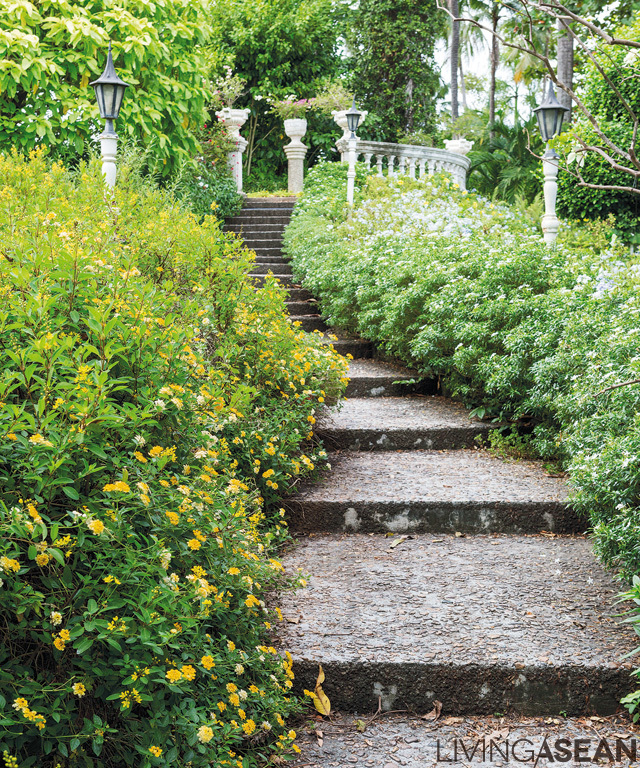 It is home to many flowers, especially local species like wild sage, gold showers, yellow cosmos flowers, and gardenia crape jasmine. All of these species thrive in their natural habitat. 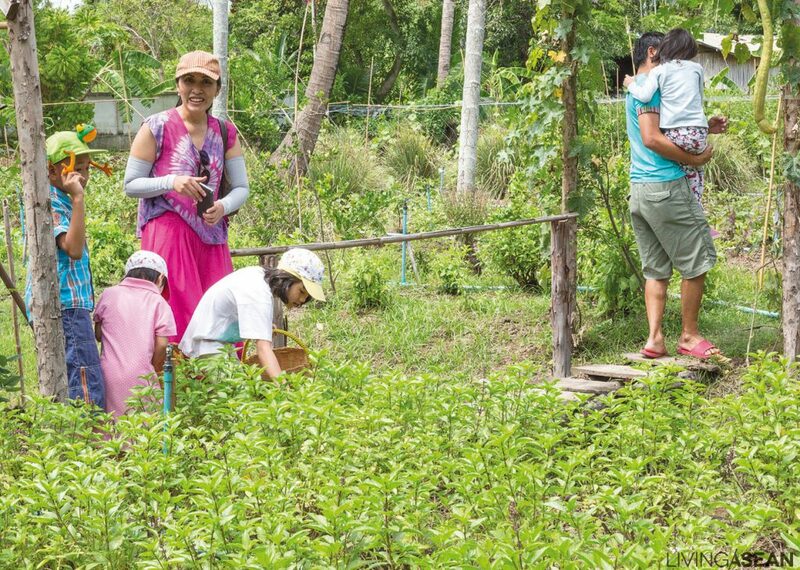 The Thai Way of Life Zone isn’t about just farming demonstrations. 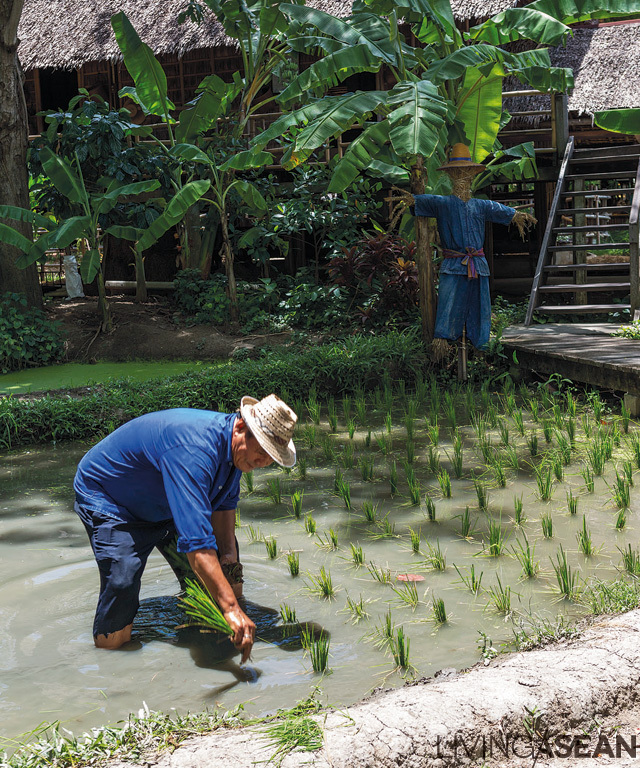 It offers hands-on experience in every step of rice cultivation. Guests can try their hand at doing it, from sowing seeds and replanting to harvesting and milling. Modern day Thais don’t chew betel nut. 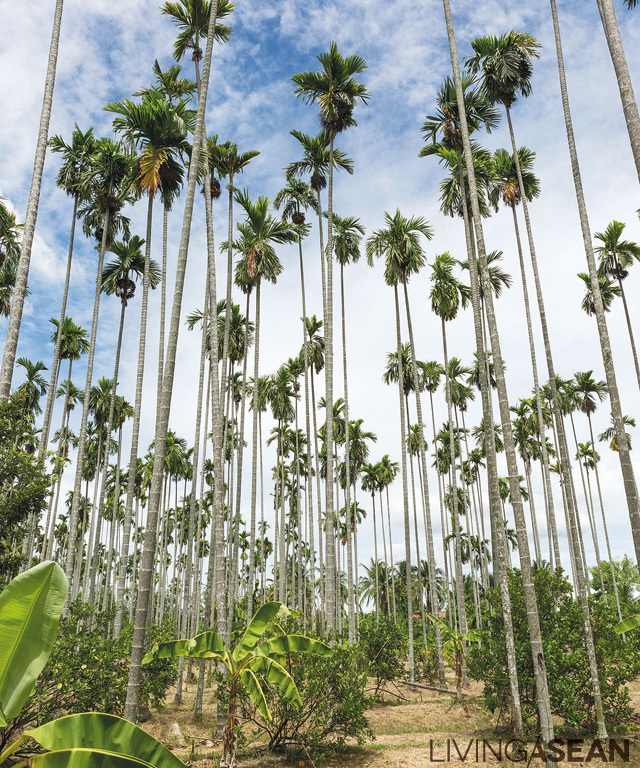 But mature Areca palms are kept on the property as part of the original groves that have stood here since times past. They tell stories of unique charm of the way of life in Central Thailand. Anirut, lovingly called the local wise man, is always there to share his knowledge with visitors. /// His blackboard shows the timetable, tips, and tricks for growing plants, making compost, and care for the vegetable gardens. Kids and parents enjoy a field day on the weekend. It’s a good opportunity to learn about farming while having fun harvesting fresh fruits and produce. 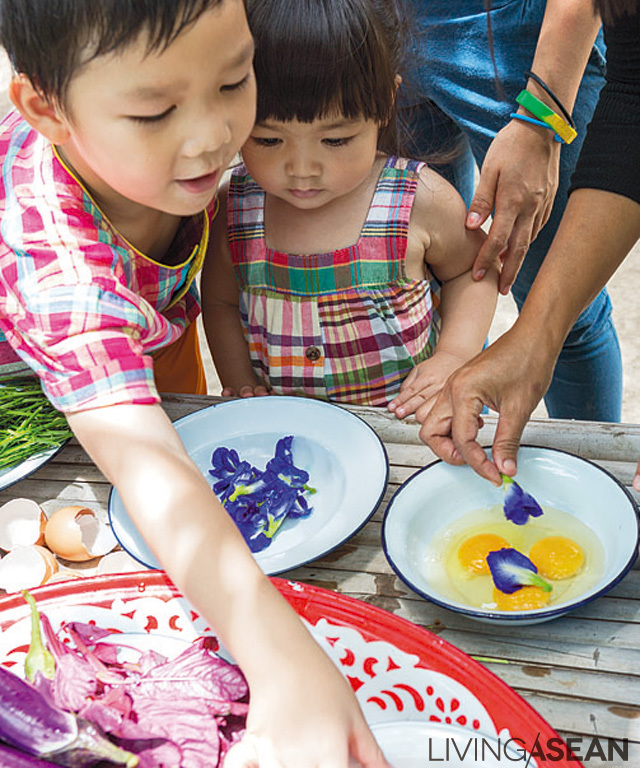 Children take stock of fruits, vegetables, and eggs picked fresh and ready for their first lunch on a farm. 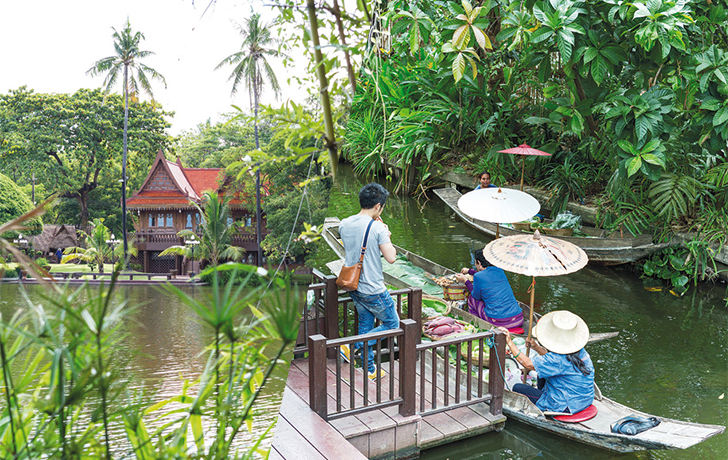 A traditional riverboat ferries hotel guests to an organic farm on the opposite side of the river.